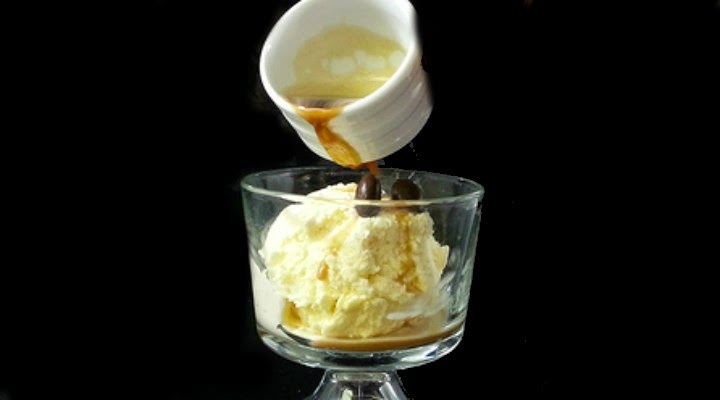 Many of you have tried our affogato as a dessert. And while feel that this simple, yet delicious dish helps demonstrate our ability to offer more than your "typical" American cuisine, we have been serving it with "typical" vanilla bean ice cream. For those who have given the dessert a try, what you may not realize is that the authentic Italian dish actually calls for gelato. To give the affogato a true Italian flavor, we have officially brought in gelato to replace our current ice cream selections. Gelato literally translates from Italian as "ice cream." There are some differences between ice cream and gelato that we feel makes these new sweet treats a step above your typical frozen dessert. Compared to ice cream, gelato is made with less fat in its base. But in many cases, many producers add flavoring or nuts, fruits, etc, to add more flavor and texture, thus adding calories to it. Gelato also has less air incorporated into it compared to most ice cream. This, in turn, makes gelato fall under a soft serve category... it would take extremely low temperatures for it to become hard and unpalatable or freezer burnt. To put this into better perspective, it's like the difference between homemade whipped cream and the stuff that comes out of the container. Homemade whipped cream isn't usually made with industrial sized whisks, so the handmade whipped cream usually tastes denser and silkier compared to the overwhipped, processed product from the store. This is the same for gelato and ice cream. Finally, the last major difference is temperature. Most ice creams need to be served at 10 degrees. If it gets any warmer than that it turns "soupy" after melting; any colder and it's a difficult brick to deal with. On the other hand, gelato is meant to be served at a slightly warmer temperature and is able to keep its consistency longer than ice cream. So in the not too distant future, you'll be able to sample different gelatos right here at the Uptown. Right now we are offering a classic vanilla bean gelato which is featured in our affogato... or can be enjoyed on its own. But pretty soon we'll be getting a little more daring with flavors like cappuccino, double chocolate, mint chip, pistachio, and salted caramel. Where else in the area can you get this velvety, smooth dessert that rises above your typical ice cream? No where....that's where. So stop in soon because we guarantee that these chilled treats will be too hot to keep around forever!